54 Page : 8 Charts : 14 K.St.N. This Booklet covers the recreation of the K.St.N. 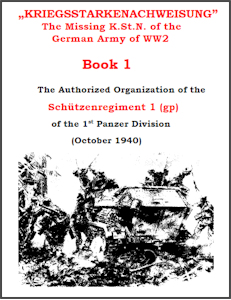 's of the "gepanzert (gp)" Schützenregiment organizations of the German (1939 -1940) early war Panzer Divisions.